You are at a National contest in Elmira in the 1950s. All this is new to you. You just started flying sailplanes - and you love it! You are trying to learn and help wherever you can at this national competition - but it is all new. You wonder - how can I help? There is an elderly fellow who seems to know what he is doing. Why not follow him? You do so and have a good time and learn much. He is generous with his time and explanations. You continue your own flying over several decades and every now and then think about this fellow who helped introduce you to the sport of soaring. Who was this fellow who meant so much in your early days of trying to learn about the sport? He was Earl Southee - a co-founder of the Soaring Society! Wow! What a privilege to be guided by him! A founding Father had helped a neophyte feel welcome in our wonderful sport of soaring. Earl Southee was that kind of person. He loved aviation and strove to help others enjoy it as much as he did. Earl Southee was a WW I instructor pilot and aviation was his life. When Warren Eaton became concerned with the safety of running soaring contests, he called on his friend Earl for help, a wise choice. No pilot will ever forget the discipline Earl brought to the contests. Earl was on the SSA Board for nine years and served one term as Vice President (1936) and then President (1940). He was the first General Manager of the SSA and when funds ran out, he continued to serve and to publish the Soaring Bulletin. He was the bond that held the Society together for its first decade. And he helped to introduce many new comers to soaring through the following decades. Earl Southee was recognized for his contributions to the soaring community. 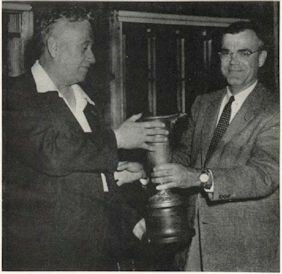 The picture to the left shows Paul Schweizer awarding him the Eaton Trophy in 1955. In addition to being a co-founder and officer of SSA, he was most instrumental in organizing early contests and was the first editor of Soaring. Earl Southee's first contact with aviation was around 1917 when he was employed at the Curtiss Flying School in Newport News as a mechanic. Curtiss was starting a new flying school at Princeton, New Jersey, for college students and needed another instructor. Someone commented that Earl Southee seemed to handle the controls well. They gave him some lessons, soloed him, and sent him to Princeton as Chief Mechanic and Number Four instructor. After the school closed, Southee went to Dayton and later to Kelly Field in San Antonio, Texas where he was an instructor. It was there he became a Second Lieutenant. Southee was involved in a serious accident when a student froze on the stick forcing the aircraft into a nose dive. The student was killed and Southee sustained serious facial scars for the rest of his life. Southee attended the Wharton School of Finance at the University of Pennsylvania in the 1920s. He continued his flying by barnstorming and ferrying aircraft. 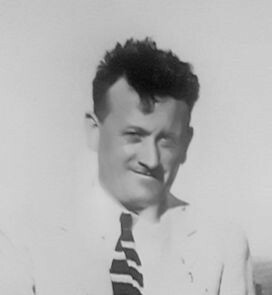 He then became an airport and flying-school manager for Curtiss which became Curtiss-Wright in 1929. 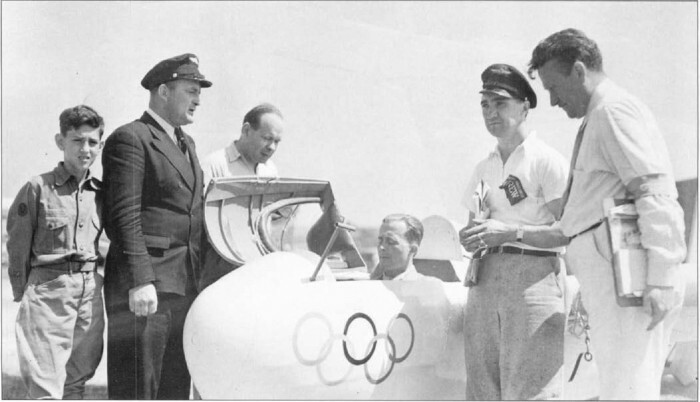 In the late 1930s there was interest in including soaring in the Olympics but plans were interrupted by WW II. Earl Southee on the right. Peter Reidel in the cockpit. In 1940 he became an inspector for the CAA (Civilian Aeronautical Authority, forerunner of the FAA). He was a leader in the Civilian Pilot Training program during WW II.